This HOMCOM rowing machine offers a great way for a full body workout, It is ideal for a home gym setup which is compact yet useful. 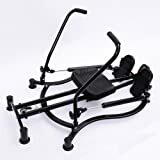 This unit provides an effective and low-impact workout that increase major muscle groups, including the back, legs, arms, abdominals and buttocks. This rower comes with adjustable hydraulic cylinder resistance arms and a manual resistance control knob that can meet different strength needs. The heavy duty steel frame ensures it is stable and durable.